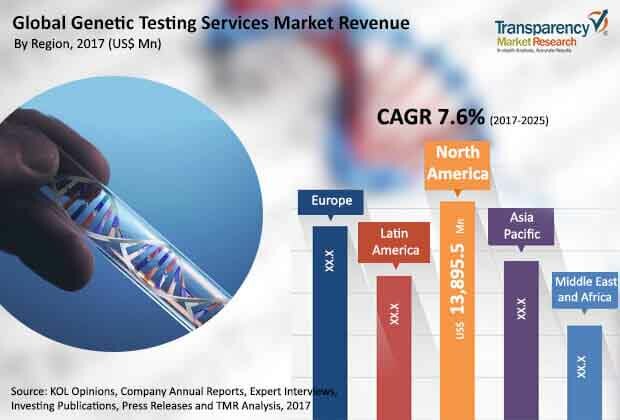 The global genetic testing services market was valued over US$ 33,500.0 Mn in 2016 and is projected to register a compounded annual growth rate (CAGR) of over 7.6% from 2017 to 2025, according to a new report published by Transparency Market Research (TMR) titled “Genetic Testing Services Market – Global Industry Analysis, Size, Share, Growth, Trends, and Forecast, 2017–2025”. The report suggests that the rising demand for innovative technologies and increasing research & development activities in the field of genetics are likely to drive the genetic testing services market in the next few years (from 2017 to 2025). North America and Europe are projected to dominate the global genetic testing services market in the next few years, owing to rise in the adoption of genetic services and increase in health care spending in these regions. Asia Pacific is projected to be a rapidly expanding market for genetic testing services from 2017 to 2025. This can be attributed to increase in medical tourism, adoption of genetic testing services, and rise in awareness about benefits of genetic testing in developed countries such as Japan and Australia. Development of innovative tests and value-added services by service providers is expected to fuel the global genetic testing services market during the forecast period. The Asia Pacific genetic testing services market is expected to register the highest CAGR of 7%–8% from 2017 to 2025. High prevalence of cancer such as breast cancer is one of the driving factors for the global genetic testing services market. Increasing early detection of breast cancer by testing of the BRC gene is driving the global market. Chronic diseases such as diabetes and other cardiovascular diseases require identifying of high-risk patients and implementation of disease management, which is made possible by genetic testing. This factor is projected to drive the global genetic testing services market during the forecast period. Furthermore, combination of health care IT with genetics and increase in health care spending are some of the factors estimated to propel the global market during the forecast period. Lack of awareness about genetic services in developing countries is one of the factors likely to restrain the global market between 2017 and 2025. The report offers detailed segmentation of the global genetic testing services market based on test type, service provider, and application. Among test types, the predictive & presymptomatic testing segment is poised to account for a leading share of the global market from 2017 to 2025. Factors attributable to the major share held by the segment in the global market include early detection of diseases such as cancer, detection of asymptomatic diseases, and identifying the gene-associated risks. The segment held over 20% share of the global market in 2016, in terms of revenue. Based on service provider, the global genetic testing services market has been segmented into hospital-based laboratories, diagnostic laboratories, specialty clinics, and others. The hospital-based laboratories segment dominated the global market accounting for over 40% of the market share in 2016. The specialty clinics segment is expected to expand at a rapid pace during the forecast period, due to value-added services offered by these clinics. Based on application, the global genetic testing services market has been classified into oncology, infectious diseases, autoimmune diseases, and others. The oncology segment is expected to hold the largest share of the global market from 2017 to 2025, due to high prevalence of cancer and increase in awareness about early detection of cancer. The segment held approximately 40% share of the global market in 2016. The others segment held the second-largest share of the market in 2016, owing to increase in the prevalence of rare diseases and rise in genetic testing in the field of obstetrics. In terms of geography, the global genetic testing services market has been divided into North America, Europe, Asia Pacific, Latin America, and Middle East & Africa. North America held the largest share of the global genetic testing services market in 2016 and is projected to continue to dominate the market from 2017 to 2025. The market in the region is projected to expand at a CAGR of over 7% from 2017 to 2025. Well-established health care infrastructure and strong support from public and private sectors in terms of reimbursements are factors responsible for the largest share held by North America in the global genetic testing services market. Rise in awareness about the disease prevention has led to improvement in the disease diagnosis, which is anticipated to drive the market in the region during the forecast period. Europe is projected to hold the second-largest share of the global genetic testing services market during the forecast period. The market in the region is estimated to expand at a CAGR of 7%–8% from 2017 to 2025. Rising health care expenditure in the region, increasing prevalence of autoimmune diseases, and entry of new players are some of the factors fueling the genetic testing services market in Europe. Asia Pacific is a rapidly expanding market for genetic testing services, which is likely to expand at a CAGR of over 8% during the forecast period. Population explosion and high prevalence of infectious diseases in Asia Pacific are some of the major factors boosting the market in the region. Australia, Japan, India, and China are potential markets for genetic testing services in the region. The market in India is expected to expand at a rapid CAGR during the forecast period, due to rise in disposable income and increase in funding for R&D in the country. The genetic testing services market in Middle East & Africa is expected to expand at a CAGR of 6%–7% during the forecast period. Mandatory health care insurance in Gulf countries and high prevalence of infectious diseases in countries in Africa augment the market in the region. Brazil also offers high growth potential to the genetic testing services market, as several diagnostic manufacturers are focused on establishing facilities in the country. Some of the key players operating in the global genetic testing services market are Laboratory Corporation of America Holdings, Quest Diagnostics Incorporated, Genomic Health, Inc., NeoGenomics Laboratories, Inc., Eurofins Scientific, Ambry Genetics, Hoffmann-La Roche Ltd., Illumina, Inc., CENTOGENE AG, and 23andMe, Inc.